SEM images on the surface of BST ceramics with different sintering temperatures as well as grain sizes: (a) 1260 °C–2 h, GS (grain size) = 0.5 µm; (b) 1280 °C–2 h, GS = 0.7 µm; (c) 1300 °C–2 h, GS = 1.2 µm; (d) 1350 °C–2 h, GS = 2.2 µm; and (e) 1400 °C–2 h, GS = 5.6 µm. 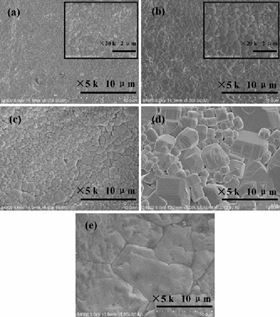 (Ba0.4Sr0.6)TiO3 (BST) ceramics with various grain sizes (0.5–5.6 μm) were prepared by conventional solid state reaction methods. The effect of grain size on the energy storage properties of BST ceramics (Tc ≈ −65 °C) was investigated. With decreasing grain sizes, a clear tendency toward the diffuse phase transition was observed and the dielectric nonlinearity was reduced gradually, which can be explained by the Devonshire's phenomenological theory (from the viewpoint of intrinsic polarization). Based on the multi-polarization mechanism model, the relationship between the polarization behavior of polar nano-regions (the extrinsic nonlinear polarization mechanisms) and grain size was studied. The variation of the grain boundary density was thought to play an important role on the improvement of dielectric breakdown strength, account for the enhanced energy density, which was confirmed by the complex impedance spectroscopy analysis based on a double-layered dielectric model. This paper was originally published in Journal of the European Ceramic Society, 34 (2014), Pages 1209-1217.